The fate of the Angry Birds is at stake. Be the one to take revenge on the greedy pigs who have stolen their eggs. Annihilate the pigs by destroying their defenses with the unique power of each bird. With this game, play through the challenging and a physical gameplay for hours. Moreover, each level of the Angry Birds needs not only skill bit logic and force for solving it. The game features challenging physics-based gameplay and hours of replay value. Each level requires logic, skill and force to solve. If you get stuck in the game, you can purchase the Mighty Eagle! 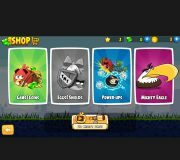 Mighty-Eagle is a one-time in-app purchase in Angry Birds that gives unlimited use. 15 unique and original episodes with 680+ levels. Enter the ‘Mighty league’ and compete against other users. ‘Power Ups’ to boost the strength of your birds. 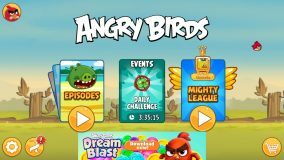 Angry Birds belongs to Arcade category and Rovio Entertainment Ltd. is its developer. This apps rating is 4.4 out of 5 stars according to different rating platforms. You may also leave your review for this game on our website so that our users may have a good idea about the app. If you want to know more about Angry Birds then you may visit rovio help center for more information. 328,299 users gave 1 star rating and 3,833,927 users gave 5-stars. This app is downloaded minimum 100,000,000 times but the number of downloads might be as high as 500,000,000. 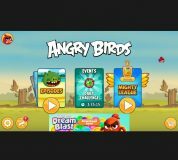 Download Angry Birds if you need a free app from the Arcade category for your device but you will need Android 4.1 version or higher to use this app. The current version is 8.0.3. The app is available in english and the total versions you can download are 12. Download APK and open it using your favorite File manager and install by tapping on the file name. If the installation does not start then you need to enable unknown sources from your Android settings. Some apps like Angry Birds are Fruit Ninja, Temple Run, Minecraft: Pocket Edition Demo, Angry Birds Action!, Angry Birds, Dan The Man, Don’t Tap The White Tile and Jetpack Joyride. If you want to write a review then install this app and rate on our website. 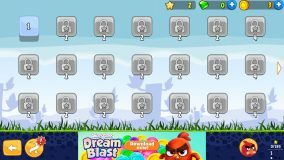 The download is hassle free as our speed is fast and we offer direct links to all the available 12 versions of the Angry Birds free.